You can follow the below steps for installing the Abandoned Cart Pro for WooCommerce plugin on your store. 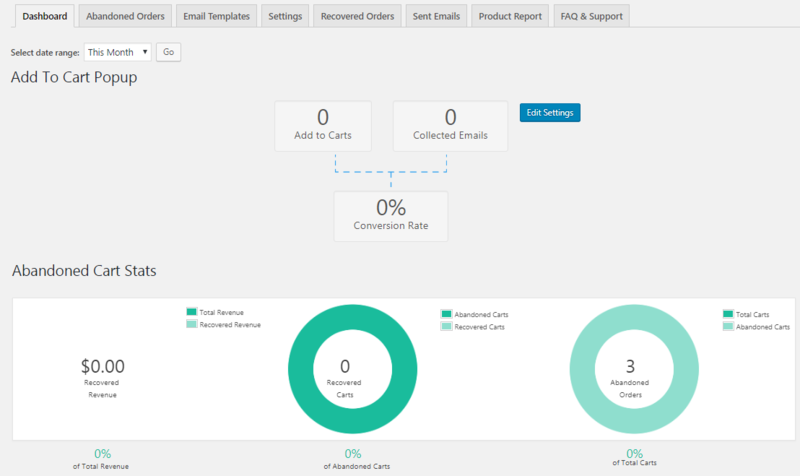 Once the store is ready, you will need to install the Abandoned Cart Pro for WooCommerce plugin. For this, go to the email sent to you after the plugin was purchased. It will have a download link to the plugin file alongwith other details like license key, order # etc. Click on the download link ( Plugin name ) to download the zip file. 3. Once you have downloaded the zip file of the plugin, go to WordPress admin page and click on the Plugins menu from the left panel. It will show you the plugins page, click on Add New and then Upload Plugin button. 4. Now click on Choose File button to select the zip file which you had downloaded on your computer and click on Install Now. This will install the plugin on your store. 5. Once installed, click on Activate Plugin option and you will be able to see that the Abandoned Cart Pro for WooCommerce plugin is now installed and activated. 6. Once the plugin is activated it will create a submenu named as Abandoned carts under WooCommerce menu. Go to Abandoned Carts page and click on the Settings tab. 2. At the bottom of the page you will find the Plugin License Options fields. Enter the license key provided in the email, in the License Key field. 3. Now click on Save Changes and then on Activate License button. The status will be changed to ACTIVE and will be shown in green next to the Deactivate License button. Remember that the plugin will work properly even if you do not activate the license key. But notification for the updates will not be visible, hence it is recommended to activate your license key during installation. The Abandoned Cart Pro for WooCommerce plugin is now ready to track and capture all the users / visitors who did not make the purchase on the site and thus retrieving them. You can make necessary changes in the Settings menu as per your business requirements to start using the plugin.